Peter and Molly. ready for Easter. Handrafted Stearnsy Bunnys. Lilly of the valley. She's a Stearnsy Easter girl. She is 8" tall and made from a lovely pale lavender mohair. it's color we haven't used before. She is wearing a sweet vintage doll dress and Vicky made her hat. $85. March 2019. So this bear really tickles me. We made it from a fabulous, vintage, Hawaiian style Jimmy Buffett concert shirt. A shirt surely worthy of life’s most special occasions. And where it’s been and what has been seen by the wearer, I can only speculate on. Probably at least some time, wasted away in Margaritaville, looking for a lost shaker of salt, I’m guessing. March 2019. Three bear custom order, 1-16”, 2-12” made from a great vintage sealskin coat. We make wonderful memories from vintage furs. Prices start as $175 each for a 12” size. 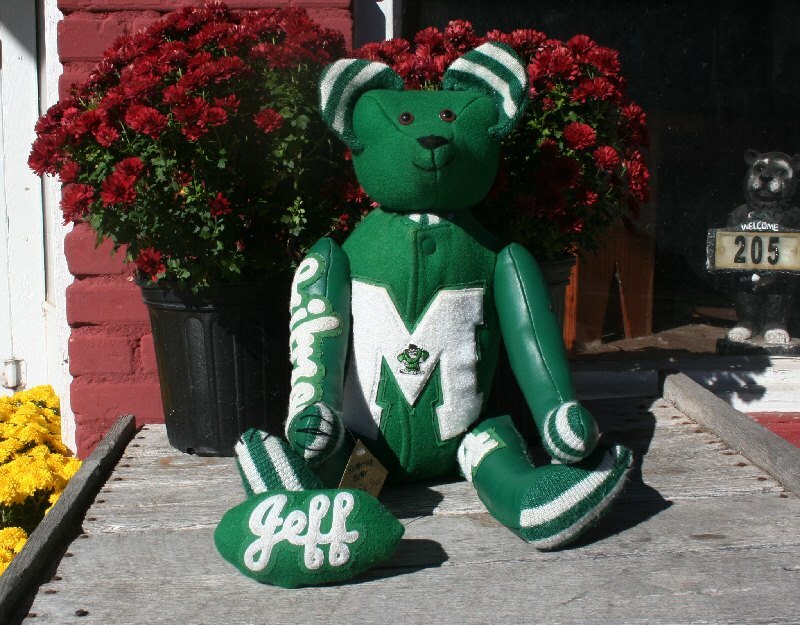 We also offer 16” and 22” size teddy bears in real fur. Let us take your letter jacket from the closest to prized heirloom piece in your home. Starting around $250 for a single bear. Leather sleeves are $50 extra.